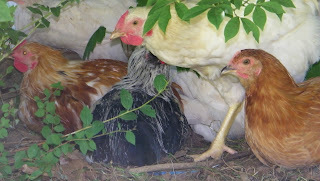 Spring Peeper Farm: Canada Day! Our store had a float in the parade and this year I had my own little paint float. We borrowed magnetic paint splotches from another Home Hardware store, put them on the truck and then I took white coveralls and spray painted them. I also splashed paint. I knew those mistints would come in handy some day. 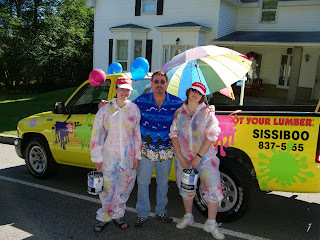 I had empty paint cans full of candy for the kids. So we were slightly popular! Ha ha. 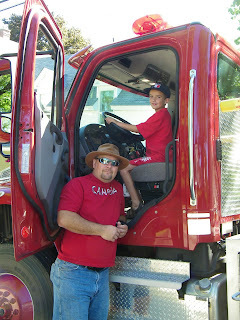 Dave and J. had the firetruck in the parade. That was one excited little boy!! It was a beautiful warm day. I was dying of heat in those coveralls. Whew! Dave and J. in the fire truck. Well my chicken watching habit is still going strong. They love going in the manure/hay pile. 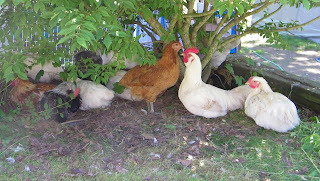 On hot days they'll go under the bushes and snooze. We don't have to whipper snip there anymore since they squish the grass under and eat most of it also. So far the only thing we have to do is put a barricade at the barn door since they love going in there and pooping on everything in sight! We brought the meatkings to get snuffed tonight. They were overdue to go. We usually only let them go to 3-4 pounds and this year it looks like they'll be 5-6 pounds. Cindi Lou has the poopies. I don't know what she got into. Nobody else has them. I left her in the barn with lots of baking soda and hay today. I'll leave her again tomorrow. Febe's milk output has gone down. She only gives 4 litres a day now. She was giving 6 litres a day, but it usually goes down after 3 months into the lactation. I mean, honestly I don't need all that milk anyway. My freezer is now full! We still haven't been able to sell Esme and Whisper. What's the scoop?!! 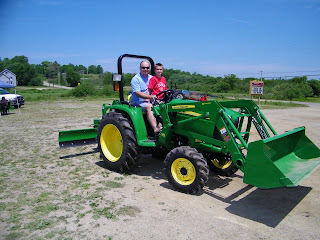 I thought I'd add a photo of J. and Dave on a new tractor. No, it's not ours. We had dealers bring in tractors on Father's day at the church this year and one of them gave Dave the keys for a test drive. Hmmmm..... I wonder if he was going to say no?? HCD back at you. I am milking a friends goats right now, wow, it's hard work! They have big bags and teats. They give about 1/2 gallon with each milking, but with the heat they are not putting out so much. Lucky me! My hands are sore. It's a great way to acquire carpal tunnel syndrome OR get rid of it! Happy Canada Day! Looks like you all had fun!